HRC announced its endorsement of Nancy Soderberg (D) in her bid to represent Florida’s 6th Congressional District at a press conference in Daytona Beach, Florida. HRC is working to mobilize more than 3.2 million LGBTQ and “Equality Voters” across the state of Florida for pro-equality candidates up and down the ballot. With over 30 years of experience in public service and foreign policy, Ambassador Nancy Soderberg has served in the White House, the United Nations, the United States Senate for former U.S. Senator Ted Kennedy, and on four presidential campaigns. She also has senior level experience in the nonprofit field and has a deep understanding of policy-making and negotiations at the highest level of government and the United Nations. 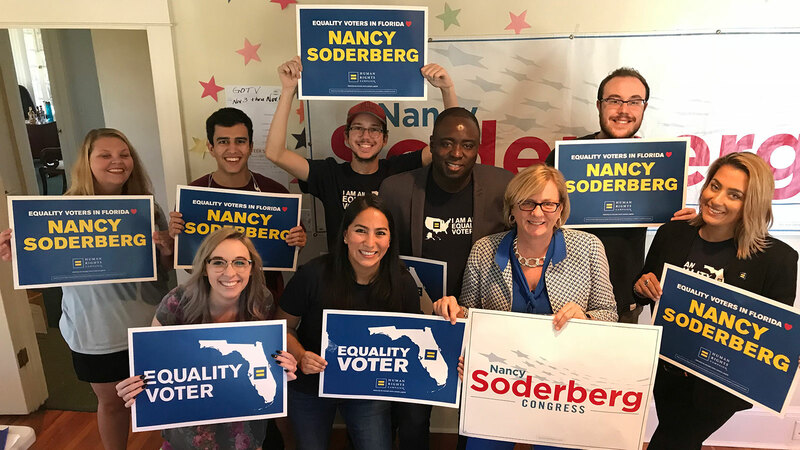 If elected to Congress, Soderberg would help to advance the Equality Act — crucially important federal legislation that would finally add clear, comprehensive non-discrimination protections for LGBTQ people to our nation's civil rights laws. Across the state of Florida, HRC has identified more than 3.2 million “Equality Voters” — meaning they are strong supporters of progressive LGBTQ policies including marriage equality, equitable family law, and laws that prohibit discrimination on the basis of sexual orientation or gender identity. Last year, HRC announced a coast-to-coast campaign to mobilize these voters for the midterm elections called HRC Rising, which represents the largest grassroots expansion in the organization’s 38-year history.